Last Fall Northcott asked me to develop some new strip packs for the Stonehenge fabrics. We had 5 existing combinations of Stone Strips, those delicious 2½” strips that are used in so many great quilt projects (each strip pack contains 2 each of 20 fabrics). Back in the day, when the original 5 were created, there were a handful of Stonehenge fabrics. The Stonehenge texture category has steadily grown to now include over 200 fabulous textured fabrics in a myriad of colors and values. My goal was to include each and every one of them in one way or another. Could I do it? I covered our sewing table with swatches of each fabric, then started creating groupings of 20 fabrics that played nicely together. I sorted and shuffled, walked away and reshuffled again, until I had 10 tantalizing groupings that even I couldn’t resist: Everest, Toast, Winter, Spring, Autumn, Sand & Surf, Lakeside, Iris, Festive, and Singapore Sling. I bet you can already picture them! Then I asked some talented pattern designers to showcase them, and they did me proud! These new Stone Strip packs and patterns are shipping to quilt shops shortly, but I have 6 packs to give away now. Click here to visit the Northcott Facebook page to see all of the new Stonehenge strip packs and coordinating patterns. They are in the latest album called Stone Strips. You have until Thursday February 28, 2013 to leave a comment. The comment you post is your entry into the giveaway. 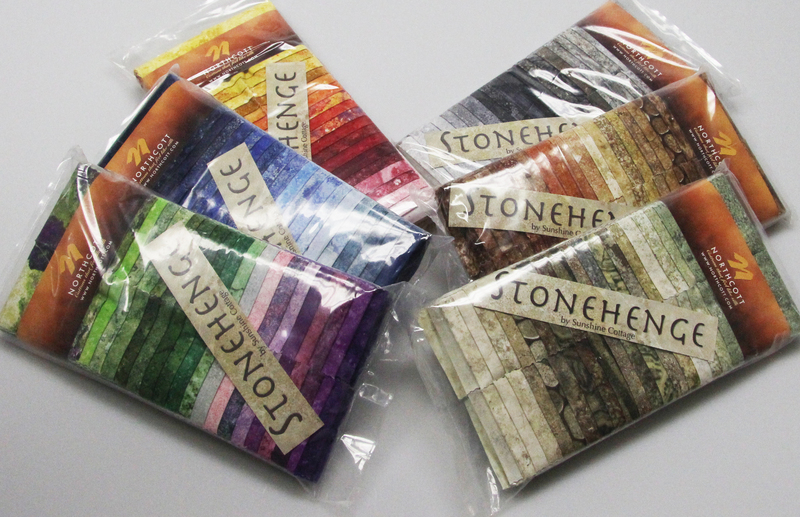 The prizes are the 6 Stonehenge strip packs shown here in the photo. I will randomly draw 6 winners on Friday March 1, 2013. Each will we awarded 1 Stonehenge strip pack. Winners will be notified via email. Oh My Golly: I love stonehenge fabrics. I was looking at all the lovely combo and I decided I really like “Sand and Surf” because these are the colors I want to do my bedroom in when we remodel the bedroom. Thanks for the wonderful giveaway. Here’s hoping I win one set. Without a doubt – Iris – (Stones85) is my favorite because I love purple, lavender, and similar shades – they remind me of wine……whether I win a set or not, I will be purchasing them as soon as Ruby Street Quiltworks gets their shipment!!!! Stonehenge Strips are really addictive. I like them all. I think Iris is my favorite right now, but that will change in an hour I’m sure. I love the Everest packet. They are the perfect shades to accent any color for the bags and accessories that I love to make. I am thinking I could find something warm and Toasty to make with TOAST!! Autumn Stones 37 is my favorite, I’m planning to make a quilt for a friend & these are the perfect colors for her. Thanks for the chance to win. Thanks for showcasing all the groups! I had no idea there was so many and am now quite excited about getting more. After all, I do have some already in my stash! My favourite is “Spring”. The hint of green makes me long for some spring colour as I look out on the snow falling, again today. Thanks for continuing to inspire us! Sand & Surf Stones-63 is my favorite because of the array of different colours. When you live between the slopes and the shore, on a wintery blustery day, you can only dream of the blue waters of the shore and warmer weather to come. This collection offers the autumn colours, the light sand, the blue skies, the clay in our gardens,green grass and foliage. Only to be rivaled with Stones-85 Iris and Singapore Sling Stones-25 for the gardens. What a difficult decision! I think I would start with the Iris collection because I love the purple! Thanks for the chance to win! I love the stonehenge fabrics and they would be so fun to use in art pieces. I love the Everest pack, would be beautiful for sceneries and mountains. Love them all – but picked Iris – jewel tones win out for me. Like Everest ….starting Smokey River today. I am way behind on Stonehenge selections! Really? Only pick one? That is really HARD! I have to say Iris because I am drawn to purples this spring. Great job putting these collections together Patti. They are all so lovely; I like Everest best because it is such a calming a palette. to finding these in a local quilt store soon! My favorites are Lakeside, Festive, Autumn and Sand and Surf. Now, choosing just one of them is a little harder, but I think I’d go with Festive. Singapore Sling is fun, too. I guess I love them all. I can’t believe I’m going to say this but Everest is my favorite (but only by a hair) I am the queen of “The more color, the merrier!” but there is something so soothing about this set! I would love to pair it with one or two brighter accent colors and make a simple, modern lap quilt from it for my favorite reading chair. I love them all! I think Iris keeps calling to me. Hope I’m lucky!!! I just have to comment that I don’t know WHO selected the names for these packs but they certainly had a sense of humor – the names are delightful!!! What a great contest! Stonehenge is my current favourite line of fabrics – so versatile and unique! I’ve looked at all the Stonehenge possibilities and I have fallen in love with Winter – Stones 94. This must be the Year of the Grey for me – I find it an elegant addition to the quilts I’m working on. Thanks for showing us the huge range of colours they have, and for the chance to win some! Somehow I missed the names, lol but I fell in love with Stones 85. With the light purples and greens which reminded me of spring! Lakeside is my favourite with a great feeling of serenity. All the lines are rather lovely. I LOVE them all! I saw them in the store and just love them. But after looking at them here I would have to say Stones 2 is my favorite. They remind me of the colors I saw in Oregon. I’ve been wanting to make my stepfather (he’s the sweetest man) a quilt with Oregon colors and these would be perfect. Love Stonehenge fabrics the Sand and Surf are my favorites. I love the teals and browns together. So many to choose from! I’d love to use “sand and surf” to make an Inklingo quilt for a girlfriend! Those are her favorite colors. It was very hard to choose a favorite but I have to say Iris. Irises are my favorite flower and the colors look like my garden in the spring. Tough choice…they are all tantalizing, but I think I would go with Stones 3…love the jewel tones…and I would use them in conjunction with an Inklingo collection. Printing the cutting and sewing lines on the back of the fabric makes for perfect piecing! LInda from Inklingo sent me over and I would have to say the Sand and Surf #63 would be my first choice I have never sewn with this fabric and would love to make something for my bedroom! Trying to choose a favourite was so difficult. Would it be “Iris”, “Lakeside” or “Sand and Sea”? I think the sand and sea colours sing the loudest to me! I love them all but my favorite is TOAST – A very nice group of neutrals! Stone strips will be so great for so many projects, so versatile. I’ve used 2 1/2″ strips to make fabric baskets, any of these collections would work for them. I like the variety of values in the Stones-2 collection. Oh what a yummy selection of selections. Its between autumn and winter for me, with Winter just winning at the moment. I love your Pandora pattern. It looks amazing in either of the two seasons. If I won i’d have to decide between the Pandora pattern use them to make the Bargello quilt my husband has been requesting for a while. Pehaps I’ll just have to go out and buy them as I have yet to win on of these giveaways. Oh, my goodness! Trying to pick just one is difficult but Singapore Sling is it for me. I love the lovely tropical feel of those colours and am already thinking of designs I’d use them in! #63 Sand & Surf would be my choice. My favorite is TOAST! I love earth tones and the wood is so realistic! They were all gorgeous, but, I think that my favorite is Singapore sling. I love the bright vibrant colors! I love the Singapore Slingpack. All of the colors are such happy colors. I have to say that Iris is my favourite, it would make such a great quilt based on Heather covered mountains! Good luck everyone. Thank you to Patti for sharing. Has to be the Iris for me too. I am new to quilting but just adore those lovely earthy, heathery warm colours. I love the one in front (greens and purples), as these are the colors I use most in my quilts most recently. They are all absolutely gorgeous!! Woodland would be sew cool to work with, I’d make a forest! I have used so many Stonehenge tones in several Art quilts I’ve completed. My heart went pitter patter as I looked at the colors in “Sand & Surf”. I’d never used or thought of using those shades of ocean blues until recently. My teenage daughter just painted her room using these colors and now I’m addicted to them. 🙂 Thanks for the opportunity to enter your give-away. I don’t think I’ve ever looked that closely at all the fabrics before. I want them all now! But if I have to pick one, it would be Stones-63 Sand & Surf (because I always want to be on the beach). I had a hard time deciding which one I liked best . They are all so beautiful. I finally picked autumn whichis Stones – 37 Hope I am lucky. Love all the colours, but I think my favourite is Sand & Surf – Stones 63. Thanks for offering this giveaway. This would be a great start to an Inklingo project! My favorite if I could only pick one would be Iris. I love the combination of greens and purples!!! Although they are all beautiful!!! I love them all!! However my favourite would be Winter. Lately I have been wanting to do a quilt based in blacks and greys and this set is a gorgeous array of them! They are all wonderful & I’d love them all! But, I think Festive would it if i had to choose just one. I love the sand and surf. It reminds me if a cottage by the sea. I”m in Love with Stones-85 – the purples and greens immediately drew me in!! The Candy Ribbons pattern would look great on my bed (a quilt for me, whoppie!). Stones 63 really caught my attention. What fun it must have been putting those sets together! I love them all, each in its own way. However, the one that took my breath away was Autumn! Thank you for showing us what is to come! I work part time at a quilt shop and am looking forward to seeing these colors come in on bolts! They are all beautiful but #43 is my favorite. Blue,blue,blue my favorite color. These strips would make a lovely quilt.. So versatile…so colorful. Love them all! Hmmm… tough choice! I think I’ll have to go with Iris; those beautiful greens and purples! Lakeside is a very very close second. Love the “Sand & Surf.” It reminds me of the trips I’ve taken to the Caribbean. Do I have to choose? I like them all, and can see end less project to do, But if I can have only choose one it would be Iris I have wall quilt I like to and they would be great for it! From first glance on the page I was immediately drawn to Sand and Surf… I love, love, love the mix of colors. Wow…! I love stonehenge fabrics!!! I just finished making the smokey River pattern with the strips!!! I Love the sand and surf set!! Would love to try out a new pattern with them!! the reds, orange and yellows! love it! I like the STONESm 6 called Festive. Just love the stonehenge series! AUTUMN definitely….it is my favorite time of year and they make me feel all toasty & warm! Woodland speaks to me of tree nymphs, but then I really love them all. I don’t think I could pick just one! They are all so beautiful. My eye kept going back to festive, would be a great Christmas project. It’s so hard to choose just one! I think I’ll say Woodland SWOOD-10 is my favorite. Sand and Surf is my favorite because it has teal. And Iris has purple so it is great. And Festive has yellow and orange which are colors I am trying to use more of… And who could go wrong with Lakeside because it is well, blue…. Woodland – luv the texture and colors. Funny now that I picked that, I’m from a river valley in North Central Idaho, and one of our hillside areas is called Woodland – much like the hollers and ridges of Kentucky! Stone 2 which didn’t have a name is so beautiful. I love them all but right now I would choose this one. My fav is Sand and Surf because it is so peaceful. It would make a lovely wallhanging! Love the festive group.. Awesome coordination.. I could never pick just one. But if I could only get my hands on one today, I’d pick the Woodlands! LOVE LOVE LOVE Woodlands! Sand and surf is my favorite. I just moved from Florida to Oklahoma and I really miss the beaches. The colors remind me of home. i like them all,but if i have to pick one i guess it would be stone 3 and autumn! Beautiful! So hard to choose. Have to go with Lakeside or Festive. Thanks! Lakeside (Stones-43) would make a lovely strip quilt for my aunt. Her favorite color is blue and I know she would love a quilt make from the Lakeside stone strips. I LOVE LOVE the Autumn. Funny that this popped up. Sunday when quilting for Quilts of Valer we had a conversation how no one in the area carried this. With that conversation I found out a store that did and will be traveling there soon to purchase some. But I would Love to win anything you pick. I think Stonehenge strips are like potato chips – hard to have just one! I love Spring – the soft greens are so pretty, I love combining them with print fabrics. Thanks for the give-away! I like Singapore slings. I like the bright happy colors. I love the sand and surf…like a breath of fresh air. Would be a joy to use this strip set for a lovely summer breezy quilt. If I was a drinking lady. I would “toast” The Toast Stonehenge strip pack! The colors are perfect for my black n’ brownish granite countertop in my open kitchen living area and would show off so pretty as a table runner on my island!! We have lots of parties thru the summer and I could showcase this beautiful fabric! Sand & Surf because it reminds of a the beach in the summertime which is where I would like to be right now! Wow! They are so pretty – it’s hard to pick just one favorite! I pick Stones-3. I love Woodland and Autumn..They remind me for a lush forest full fo trees. Toast is also a favorite and I really like purple so Iris is also great.Any Stonehenge would make a beautiful quilt. Sand & Surf, because they are my best friends colors or Iris because I love Purples & Greens and have a Quilt to make for Christmas. The iris pack is my favorite. I love the combo of green and purple. Thanks for the chance to win!! I love Stones – 2. The colors are so cheerful and happy. However they are all awesome. The Singapore sling pack is my favorite! Anything with red gets my attention! I love Northcott fabric and especially the Stonehedge collection. Have already made a quilt for my soninlaw for Christmas. I love the pack of greens but would be happy with any. Want to use them with Inklingo. Thanks for having thegive away. Hope I win one. That’s a hard choice but I did narrow it down to two. Singapore Sling and Sand &Surf. They remind me of a tropical beach at sunset. If I had to pick just one it would be Singapore Sling. I love the red and yellow! Very cheery during dreary February! I love them all! Anyone of them would do so nicely. Like everyone else has said, it’s hard to pick just one. I am really feeling the blues in Lakeside and Sand and Surf. Thanks for a chance to win one of these awesome collections. Oh man that is a very hard choice.. between the Lakehouse or Sand & Surf…. but really I loved them all!!!! I LOVE the Stones 3… although it was a bit of a tossup for me between that, Stones 25 and another one. Just gorgeous!! What a hard chore it is to pick one but if I must I’ll pick Singapore Sling. Love them all! Oh, to only pick one!!!! It would have to be Iris!!! Iris, Lakeside and Singapore Sling are great colors! I also loved Winter. You did an excellent job coordinating. I can picture these in so many projects. My favorite color is purple, so that’s always my first choice, but I also love blues and brights. Singapore Sling is just fun! They are all beautiful, but I would have to pick stones 3! Thanks for sharing! Loved them all!!!!! But I would really enjoy working with the STONESM-6 colors!!!!! I would choose Festive because the colors are so vibrant and versatile….can’t wait to make a colorful wall hanging! I love them all but Stones 85 is my favorite by far, love the purples and greens. I love so many of them but if I have to choose my choice would be either Stones-3 (my favorite colors) & Stones-25 (the colors would be great for my granddaughter’s big girl quilt. My eye was drawn to the red/orange/yellow one – Singapore Sling! It is so cold and gray and dreary here this winter. That set looks like a Caribbean sunrise – so bright and bold and cheery. It’s just the thing to help me through this last month of winter! I luv the Stones 85 range because they have a really fresh, bright look to them. They are all very nice. My net is playing up so I am not sure if my 1st entry went through. I LOVE the spring package! The greens are amazing! OMG! I love Iris, no, sand and surf, no, spring? I can’t decide. Love them all. So beautiful and can imagine the quilts that will come of these…Thanks for the chance! love these! faves = sand & surf, spring, and stones-3. I’m a diabetic. This is the only candy I can have that doesn’t raise my blood sugar and would make my doctor happy. Plus, it’s the type of thing that keeps the psychiatrists in the area from getting any money from me (ha, ha) Quilting is the best therapy EVER !!!! Seriously, we have to pick only one favorite?! Impossible! Usually am a ‘brights’ person, (think Singapore Sling or Iris), but recently I find myself loving the tans, browns and creams (think woodland, Autumn or Toast) or the grays and blacks (think winter), or the. . . Oh yeah–just one. I think I’d have to pick Toast. Stones – 30 is my favorite, this colorway would make a beautiful wall hanging for my living room! Thanks for the chance to win! It took me awhile to decide but I think Autumn is my favorite. I’ve always been attracted to browns. It feels like Halloween, Thanksgiving and sweatshirts. Oh so many to choose from. I love Stonehenge fabrics. I have made 2 quilts so far and have more to make. I really like the Sand and Beach, but will be fine with the Everest. But to have to pick, they are all to wonderful to choose from. such a wonderful material and they are all calming to me. I used one to make my Christmas tree quilt. It was the Festive package. My quilt turned out great and I received many compliments when I showed it at my quilt guild. They are all beautiful but Sand and Surf caught my eye right away. The colors remind me of going to Cape May with my children where we would spend hours looking for sea glass and Cape May diamonds. I love the festive. The colors are great! I love the Autumn. Living in the northeast, the fall is so beautiful and colorful. I love the earthy colors! These colors would make a gorgeous quilt. Hope I win. I think I like the Autumn collection. I loved the stones 3. Reminds me of the outdoors and it is too cold to be outside here! I love the Iris pack, it reminds me of my late great grandmother Iris 🙂 She was named for the beautiful purple Iris flowers out in bloom at the time she was born and I would love to make a quilt to commemorate her. If I have to pick one, it would be Iris. But I liked Surf and Sand too. And Singapore Sling. And I love the patterns you have used to showcase them! Tough choosing just one, but I would have to say Stones-3 would be my favorite! They look beautiful in the Blueberry Hill pattern too! I just love the colors! My favorite is Iris! The jewel tones are my favorite colors! They remind me of flowers and make me smile! Ah.. Stones 63. Love the seafoam & beach colors that remind me of relaxing on the beach with tropical breezes coming off the ocean. Singapor Sling is is the Stonehinge Strip Pack I love. I have this thing for orange and pink combo quilts. Made a real pretty modern quilt with oranges and looking to make another. These are beautifully perfect! Oh boy…,I have been obsessing about Stonehenge since I first saw it in Keepsake Quilting catalog! My favorite from your group of photos is Iris, followed clOsely by Original. And I recently bought the Entwined pattern and really need Ribbon Rings! Purple is my favorite color, and greens are so versatile! Stonehenge green strips, and the new St Paddy’s Stonehenge, are my ideal fabric to make a Double Irish Chain–my husband’s family is almost all Irish. I really love the Stones-94 black/white/grey package…I would definitely add to it with another Stonehenge color but the black/white/grey would be fabulous to win! 🙂 Thanks!!! Love the purple. Stone 85 for me! How can you pick just one??? The gray, no the browns, no the blues! I like them all!!! I love so many of them.. I think Iris is my favourite . But I love the festive pack as well. Its hard to chose just one. I really like the Toast strip set. The colors are perfect for a big bag I want to make.. They are all so beautiful but I think my favorite is Woodland. Great colors. Thanks for the chance to win! I like festive. I actually have some for a quilt that our local quilt shop is sponsoring for a Block of the Month program. Pictures just don’t do justice to how beautiful all these fabrics are. Do I have to pick just one? I used Stonehenge fabrics for the wedding quilt I made for my grandson and his wife. I think Iris is probably my favorite but Autumn was a close second. Such a difficult decision… Iris is the one calling loudest to me. Green is my favorite color of all time. Lately I have been pairing it with purples and I just love the results. My favorite is Iris. It is soo pretty! I could have such fun with ANY of these pallets, but I must put my vote in for Stones-2. The rich browns with just a touch of blue and pink are so warm. I can imagine wrapping up in these colors for an afternoon nap! I agree with so many of the other comments posted. It is hard to choose just one. I can only narrow it down to 3: Festive, Iris and Autumn. Thank you for a chance to win some beautiful fabric. Iris is definatley My favorrite. But they all beautiful. I love the earthy grays of the Everest strip pack. I can see using them in an appliqued naturescape or fabric collage, or as neutrals in a pieced quilt. So many possibilities! In fact, all the strip packs inspire lots of ideas! They are all beautiful and I can imagine a different project out of each color. Really couldn’t pick a favorite. Love the purples go Iris but also the grays of Singapore Sling. I love them all, but the one that really stood out to me was stonesm6 called Festive. That royal blue is just gorgeous! My word, it is hard to choose only one, but I would say Iris. Purple is a wonderful color & goes well with green & cream! I am embarassed to say that I am not familiar with Stonehenge but I have looked them over and decided that my favorite strip pack is Singapore Sling. If you ask me again tomorrow, I might have a different answer, but I will stick with singapore Sling for now. Beautiful!!! It is so hard to choose a favorite as i like them all but the stonehedge 3 reminds me of the waters I see on my quilting cruises. Sand and Surf is my favorite, but they are all wonderful! I’m just a sucker for anything turquoise, teal, aqua, blue-green…you get the idea. Thank you for this opportunity. Sand and Surf is my number one choice. I was drawn to the warm, soft colors of the sand and surf as i listen to the cold, winter wind whip around my home…..making me wish for some sand and surf right now. Ohh, how to choose just one. Hmmm – I guess I’d say Sand and Surf – need to see some summery colors just about now! These fabrics are so gorgeous! It’s hard to pick a favorite but I think mine is Stone 68 because of the variety of colors. I do believe that my next quilt and table topper will be made from this line! You, my dear Patti, are a GENIUS!!! I have been looking at the Stonehenge fabrics, and looking and looking, since they were first introduced but was totally bogged down with how to use them. Your genius is in organizing them into strip sets that I actually can “see” in so many different quilt patterns. Whether I win a set or not I now have the motivation to purchase some of these beautiful fabrics. Thank you!! Beautiful groupings. I love Stones-63 Sand and Surf. Teals and browns are one of my favorite combinations. Love them ALL but Stones – 63 is my favorite. I have made 2 quilts with Stonehenge fabrics and just love working with this fabric. Thanks for coming out with such wonderful new colors! I love the Iris Stonehenge strips. They remind me of spring! I have to say that the Autumn pack has to be my favorite! I live in Houston where we have two seasons, summer and a cooler summer. I long to see a change of seasons, and Autumn colors have always appealed to me. The colors remind me of a trip that I made to the Smoky Mountains one beautiful October. I’ll never forget those colors! The Autumn pack of the Stonehenge strips reminds me of that trip. I like many of them, but I think I’d chose ‘Iris’ because I can ‘see’ a landscape idea developing in my mind using those beautiful purples & greens. it was hard to pick just one. I went back and forth between Lakeside and Sand and Surf. They are all beautiful. So hard to choose from such beautiful selections. My favorite I’m guessing would be Festive for its rich and vibrant colors. Iris is also a favorite for its combination of greens and purples. Lovely. I really like Iris… purples and greens are my favorite colors…. they would make a really nice throw quilt for my living room!!! Sand & Surf most definitely! Some of my fondest memories are at the ocean. Like them all….but love sand and surf myself, the man in my life says its everest for him. I personally would be happy with winning any of them. I love them all, but I think I like Festive the most. I’ve already made a beautiful quilt with one of the first five packs, and think it’s the most beautiful quilt I’ve made! I like Sand and Surf, but Festive is a close second. They are all gorgeous though. Thanks for the chance to win. Autumn is my favorite. I think a table runner would be a good project. It was hard to choose which I liked best. They are all so beautiful. My favorite has to be Stones-63 because of the turquoise. I love the stone henge fabrics and my favorite is all of them. I love the bold colors # 25 is my pick. But since i plan on making a lap quilt for a friend who is undergoing his 3rd knee surgery I think Stone 63 would be a nice choice for him. I am quite drawn to Winter – Stones 94. The colors remind me of my visit to Stonehenge many years ago. It was so interesting to read the other comments. While they are all absolutely delightful, I still have to go with my favourite colour. So Lakeside it is. …..hmmm thinking cottage already. They are all so delightful, but I have to go with my favourite colour, so Lakeside it is…….hmmm thinking cottage already. I LOVE the Stones 85! What a beautiful quilt this would make 🙂 Thanks for the opportunity to win such an AWESOME prize! All Stonehenge fabrics are awesome! To pick only one group is hard, but for me it is Iris. I am making a lavender quilt and could really use these. HOPE!!! I was immediately drawn to stone 63. All the fabrics speak I earthy whispers of tranquility. But 63 reminded me of crystal pools of water and the stones the water caresses. Thank you for the opportunity to win such fabulous fabrics. Love the Sand & Surf pack! I am drawn to anything that reminds me of the beach. There are lots of wonderful color combinations, but I think I like Stones 63 the best. Woodland is definitely my favorite strip set. I especially love the gray pebble print and wish I could put that on my master bathroom floor! Choosing is not easy. I have been drooling over Stonehenge for so long. If I must choose only one it will be Stone 85. Lakeside, the blues are so yummy I have picked a nice pattern to showcase these beatiful colors. Again many easy color combos. I’ll have to keep checking Stichnheaven and a few others in Littlerock. My favorite is Stone-74 Spring because the color is calm and relaxing. Or perhaps I’m so ready for spring?! Well, I like all of it, though. love autumn [stones 37] for its rich autumn colors that are so gorgeous each fall. Singapore Sling would have to be my favorite… I love warm colors and anything with red in it… would make a great quilt!!! Singapore Sling would have to be my favorite… I love warm colors, especially anything with red in it… It would make a great quilt~~~ Thanks for running the contest! No battle, Lakeside has to be the best. Perfect name. I can’t wait to win so I can pretend I am at the lake and seeing the beautiful shades of blue water. So serene! I really have fallen in love with ALL the Stonehenge fabrics, it’s a shame here in Europe the shops don’t sell them, if you’re lucky you might find the odd one or two, but there are soooo many lovely colors and textures. If I have to pick one I think I’ll go for the Singapore Sling because of the lovely bright colors, they make me happy, beautiful for an applique flower quilt. Sand and Surf, definitely, because it reminds me of the island where I grew up. Gorgeous! I love stones-3. Perfect for the colors I love. I love all of them but Stones 85 is my choice. These are my favorite colors. Love this whole line, but the Winter pack is my favorite. I’m venturing into Watercolor quilts so packs like this would be perfect for a project. Festive group. I must have gone to the wrong place, didn’t see the names for the others. Fall colors! Love them! So Stones 37 is my pick for a basket weave quilt I’ve been wanting to do! Hands down, it’s Singapore Sling for me! Autumn and Toast are my favorites. I would love to have any of the strip packs to create a quilt to show to my local quilt shop, sadly, they do not carry them! I’m stuck between Sand and Surf and Singapore Sling!I love these fabrics. Thanks so much! I have close to 12 yards of the earth tones on hand at all times they are just so versatile. But I absolutely Love the richer darker jewel tones that are out now. Would Love a Whack of these. So many to love!! Toast is a favorite. I love warm earthy colors. Surf and Sand! Love Stonehenge’s selection! Gorgeous fabrics all around! Wow, love them. Would have to go with Toast right now because of depth of color and contrast. Close second is Festive for same reason! First one that jumps is Sand and Surf…so pretty! Love them all…but I’ll choose Singapore Sling…and lots of projects come to mind! Every Stonehenge fabric I purchase is my new favorite. I run in the woods and am inspired to make a quilt that represents that – browns for the trees blues for the sky and various greens. I think the Toast – Stones 35 series would be perfect for the browns! I love the Iris collection. The juxapositon of the greens and purples will inspire a beautiful project. They are all beautiful but I’ve always had a thing for Sand & Surf! Love the new Stone Strips. They are great for our Strippy Quilts class projects. Can’t wait to purchase & make a quilt with Iris, Festive or Singapore Sling. Like the colors – ready for spring!!! I loved Stones-1. When mixed with other colorful Northcott fabrics, it would make a beautiful scrap quilt. The strips in this package would make gorgeous neutrals. All of them are gorgeous!! I think my fave is Stones 3, it’s so hard to decide. Surf and Sand. All of them are lovely, but that one gives you an island get-away snuggled up in your quilt! Love the Singapore Sling pack with all of those warm colors. My favorite is Festive. Why? Don’t really know, it just speaks to me. They are all fabulous! I’m always drawn to blues so if I have to pick a favorite, I will go with Lakeside. It has to be Stones 25-they are bright, bright, bright! Stonehenge is Beautiful in any colorway, but my first choice will be Stones 94, the greys. A must have for my stash. Hi! Pat Tobin!!!! How are things in the West? Get serious you want us to choose JUST ONE!!!! Not going to HAPPEN!!! I LOVE Spring, Toast, Winter, Autumn, and Everest. I would be THRILLED to win any of them. My favorite is the Stones 3 group. I like the cool blues and greens, they remind me of the sky and grass and plants in my garden in the spring time. Today its cold and snowing so I’m dreaming of springtime! I just love the Iris Stips with the greens and purples! they are so spring like and inviting, Also a little Irish in me, so I know I could always come up with something for St Patricks day with them. Sand and Surf, Lakeside and Stones 3 is my favorites. Can be something very nice in summer in my home. To look at, to feel and to make. I love sand and surf. The combination of earth and water colors with the rich textures is inspiring. That said, I also love Lakeside for the same reasons but with mostly water. These are great fabrics. Stones-63. That group is playing well together! My favorite is Stones 2. I love the variety of colors. They would make a great basket! I love #25 brights the colors used to be out of my comfort zone but I am changing and bright colors add the pizzaz to make the quilt shine. Tough to pick one – they are all great! I like sand and surf – I need a vacation somewhere warm! Just love Stones 94. Calm & beautiful. I just got back from my 30th anniversary trip to the Hawaiian islands — and Sand & Surf (Stones-63) is calling to me evoking memories of sand, sun, surf, snorkeling and all of the colorful fishes and shades of sun-touched waters in Hanauma Bay and Molokini Bay. These colors are perfect for the tropical fish quilt patterns I bought on the islands of Maui and Hawaii! These are all so gorgeous, it’s hard to choose just one! I think my favorite has to be #63, Sand and Surf. Those are my favorite colors right now! Stonehenge O Canda! I didn’t know that Stonehenge made this line. I don’t live in Canada but that doesn’t make a difference, the colours are great. People that made the “Quilts of Valour” in Canada are awesome and their reason for making these quilts are why I like this line. I love Autumn. It feels cozy, and the colors are beautiful. The men in the house would love it! I really like the Everest. Very difficult decision to make as all of them are beautiful! Love, love the Singapore Sling!! It has been hard to choose Sand and Surf from all these stunning colors! LOVE the TOAST. For some reason I AM DRAWN TO THESE COLORS? Love this fabric. Aahhhhh…i breathe, therefore I quilt. My favorite has got to be “Toast”. So warm and cozy looking! Can’t decide between Iris and Singapore Sling, love the water colours! Love them all, Iris or Festive for my favorite. Oops, sorry I missed all the fun 😦 But I will be sure to be watching for these fabulous fabs to show up at my favourite quilt shop for sure!! Absolutely love the Stonehenge. If I had to pick a favorite I think it would be Sand & Surf. Love those blues. the Lakeside stones. Blue being my favorite colour I need some in every quilt in possible. Singapore Sling and Sand and Surf! I love the sunset colors and the fall colors and I find that other colors weaved in are just perfect to highlight the differing tones but not so much of a contrast that they fell “disjointed” when you are looking at them. The blends are beautiful and leave you focusing on the group and not just one color that you like. Very attractive to the eye like looking at a great painting. Brings calm and peace to the soul. Favorite? Sand &Surf. I’m working on Smokey River and I love the neutral packs! I really like all of them, but I’d really like Lakeside as my granddaughter has asked for a quilt using blues in these shades.